We conduct annual and emergency gas and boiler inspection service anywhere in Musselburgh, Dalkeith, Livingston, Leith or Blackford. We ensure your boiler works efficiently and optimally. By carrying out general boiler maintenance and servicing and checking on the controls, we resolve all potential complications. Our gas engineers identify the cause of the problem and conduct effective repairs. They adhere to all laid down standard as stipulated down by the manufacturer and relevant regulatory bodies. Apart from this, we offer help and give advice on various ways of detecting and handling gas and boiler leaks before out experts get to you. 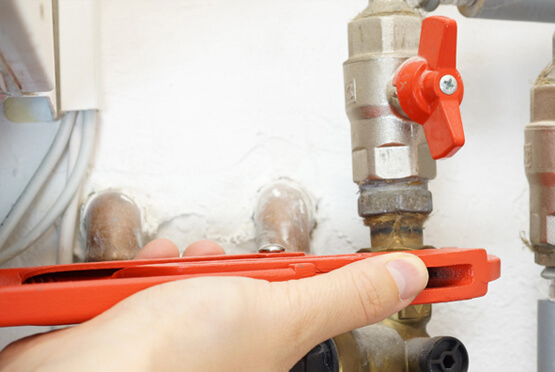 Gas and boiler leaks can arise due to, but not limited, to the following reasons. Corrosion is the main cause of many boiler and gas leaks. It is common in parts susceptible to rust. Corroded pipes, valve and tanks can succumb to corrosion; this may eventually lead to gasses and fluid leakage. If not repaired or controlled immediately, the leakage may cause damage to the property. High temperatures may cause structural damage to the appliance prompting some function to cease. The temperature valve may be crippled or other gauges inhibited by extreme high or low temperatures. Gas and boiler leaks can also be caused by poor installation and maintenance of the apparatus. Poorly fitted, badly maintained seal or valve may cause leakage and corrosion, which may in turn cause electric components within the boiler to short circuit. This may lead to an explosion or total breakdown of the whole apparatus. This may translate to heavy cost in repairing or replacement of the boiler. We are professionals in boiler servicing, boiler repairs, boiler installation, gas and boiler leaks, central heating installation and central heating repairs. We conduct elaborate inspection of boiler and controls, and general boiler maintenance and servicing at affordable prices. We test and repair the appliance in accordance with manufacturer's instruction and run through complex troubleshooting drills to ensure your comfort and safety. Our operations are conducted by friendly and knowledgeable Gas Safe registered engineers, who have vast wealth of knowledge in this field. Determining the cause of gas and boiler leak can be challenging and requires finding out exactly where the leak is originating from. For this reason, we have invested heavily in the latest technology to assist in the assessment of the apparatus. Our accredited Gas Safe Register engineers use a full range of leak detection equipment needed to locate pipes and cables and basic signs of wear and tear. They pinpoint valves malfunctions and water leakage positions. When all the inspection and remedy is offered, our engineers leave the site tidy and clean. They use specialized boiler cleaning equipment. Our services are impeccable and our reliability excellent. Call us now for emergency gas and boiler leaks services.